CarShipping1.com is the #1 resource for all your car shipping, boat shipping and vehicle transport needs. We can assist you with local, regional and coast-to-coast vehicle shipping services from anywhere and to anywhere in the USA. We work with the best car carriers in the business who provide a wide range of vehicle and boat shipping services. These shippers offer safe, secure and timely auto transport. CarShipping1.com and our affiliates specialize in vehicle transportation and we are in our third decade of providing unparalleled shipping services. 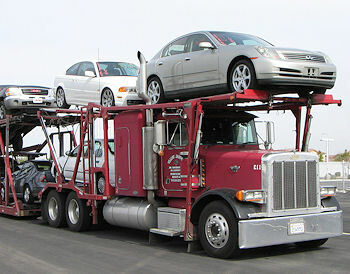 If you are in need of car shipping, motorcycle shipping, ATV shipping, boat shipping or any other type of vehicle shipping service, you can't beat the vast resources found at CarShipping1.com. When you submit your CarShipping1.com quote request you can be assured that you will receive competitive rates and many options to consider from car shipping companies that will transport your vehicle in a safe and timely manner. Many of the car shipping companies we work with offer door-to-door service or terminal-to-terminal service for a lower rate along with open trailer or enclosed trailer service. Additionally, many of the car shippers we work with offer their service with or without insurance (use your own car insurance and save money). Expedited car shipping service is also available if you have a short-term delivery deadline (usually for an extra fee). Any combination of these service options is available for your consideration, in order to meet your own specific car shipping needs. At CarShipping1.com our #1 goal is to build a lasting positive relationship with our customers by providing excellent service and a wide variety of shipping options to choose from. We want you to feel confident enough in CarShipping1.com to allow us to handle all your vehicle shipping needs, and to recommend our shipping services to other potential customers. Thank you for considering CarShipping1.com. Your next step is to submit your vehicle shipping quote request. Who Uses Car Shipping Services?